Are you searching for a compact treadmill? More people are buying compact treadmills because it makes room for other home gym equipment. These room-conserving models are a fantastic option when space is an issue, especially if you're planning to run regularly in an apartment, small condo, or small bonus room in your house. To save even more space, most of these treadmills fold up as well. Folding a treadmill away can reduce the footprint significantly and some will even roll away into a large closet. Manufacturing technology has improved significantly over the years, making many of these compact models just a sturdy as the traditional non-folding treadmills. You may even find a couple of these space-saving models on the top treadmills list. The only major drawback to owning a treadmill is that they are massive machines that take up quite a bit of floor space. There are so many people out there who would love to own a treadmill, but they simply don’t have the extra space to accommodate it. Compact treadmills are an ideal solution to this problem. As the name implies, compact treadmills are perfect for home owners who lack floor space or need a machine that is easily portable. Designed with a lighter-than-average frame and transport wheels, compact treadmills also fold to take up even less space when not in use. However, there are downsides. Designers are forced to make sacrifices with some specs in order to produce light and foldable frames. Unfortunately, that means some compact treadmills simply aren’t strong or durable enough to support regular use. It’s important to research, compare, and consider all aspects of any compact treadmill before purchasing. If you’re thinking about buying a compact treadmill, it’s good to weight the pros and cons. Always make a comparative decision to ensure that a compact treadmill is the best fit for your needs. 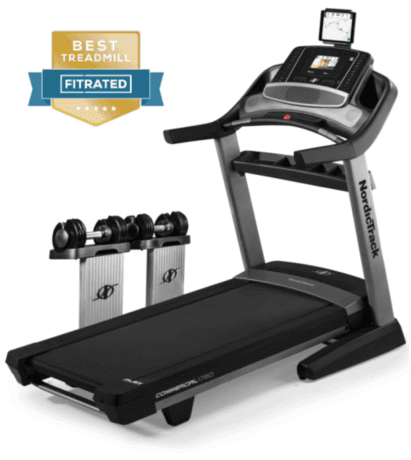 One big benefit of many compact treadmills is that they are typically more affordable. So if you are on a tight budget, consider leaning in this direction. However, never let the price tag trump the functionality of any compact treadmill and your fitness goals. It’s important that your treadmill has the capabilities to support your goals and progression. Always factor in skill level when judging a machine and give yourself space to grow. If you are a larger individual training for a marathon and plan to clock hours on the treadmill each week, you may find that the compact treadmills simply can’t provide the comfort level you’re looking for. While it’s great that compact treadmills take up little floor space and costs less, if they don’t get used or break down quickly, who cares?. So, what are the “pros” to look out for in a compact treadmill? Glad you asked. Here come the answers. These small treadmills are typically equipped with wheels at the bottom for easy transport. Moving them around between use is easy and generally doesn’t even require a second person. Compact treadmills are smaller in length and width than regular treadmills, easily fitting into smaller spaces for users who can’t sacrifice an entire room for their exercise machine. Most compact treadmills are also foldable, taking up even less space when they aren’t in use. In general, foldable treadmills are far more affordable than standard treadmills. Now that you’ve seen the benefits of compact treadmills, it’s time to get honest. Consider these common downsides before any purchase. With less space available, you won’t get as many bells and whistles on a compact model. For example, the screen console is generally quite a bit smaller and there simply isn’t room for fans or other similar ad-ons. Because these treadmills are compact they also weigh less and likely won’t be as stable as their heavier counterparts. They will feel wobbly for heavy users or runners seeking high speeds . Again, because of their smaller size and desire to be as compact as possible, the frames of compact treadmills typically aren’t as strong. So you may run into more issues with breakdown if you are using them regularly or doing high intensity exercise. It’s important to consider exactly what you require from a treadmill to determine if a compact model will work for you. Not everyone is well suited to these treadmills, so despite their lower price and ease of home use, they aren’t always the best option. If you are lucky enough to have more space at home to store a piece of fitness equipment, you may be better off using one of the larger models and getting all those additional benefits they have to offer. Do keep in mind that compact treadmills have come a long way in the last few years and aren’t always inferior to larger commercial models. There are now many impressive options available to consumers who want a smaller machine that still provides a great workout session. In the end, it all depends on availability. If space is a premium in your household, you’ll need a space efficient treadmill. Just always be aware of what you give up to save that space.